May I know who is your SS . If it is OK for you. Who is building with Rawson home in bardia ,Edmondson park and what stage they are in ? Who is your site supervisor? Hi Got drop edge beam. My garage need to be 3step lower then house so I keep 2 step in garage and one in laundry. I also got council rates and charges. It starts from the day land register under your name. Does any one know how much it cost to build Driveway ? According to bardia rules we cant make plain concrete driveway. It need to be stamped or stencil driveway. I am building Huntley 30 with Rawson homes on Alamein street. My one also come as M class. I am also doing Huntley with few changes. who is your pre construction coordinator.? . did you get your floor level advise from council?? When I checked on google it says habitable area are living room,kitchen,bed room etc.. I am building on Alamean street with rawson homes. Where you are building in bardia? i am on alamean street. what is meaning of adjoining finished ground level? does this mean garage level? or level after builder cut or fill the land? Does anyone have flood study map for Bardia. area has any special requirement? 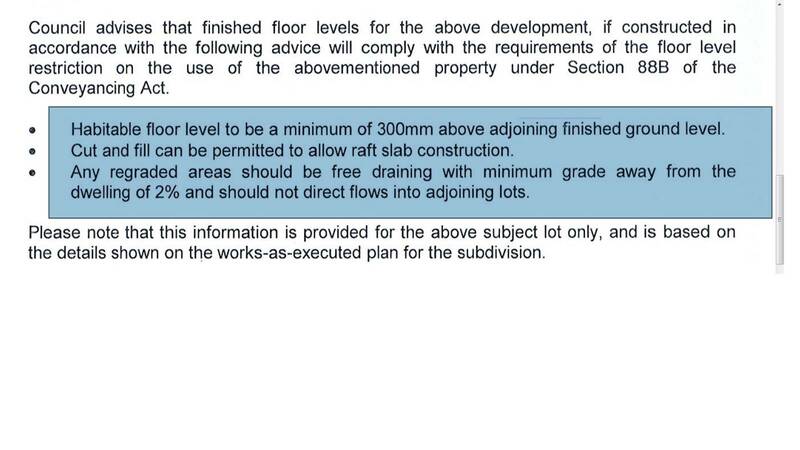 can someone send me their floor level advise from campbelltown council?